Instaflex has the right ingredients. May need to use it for six weeks or more. 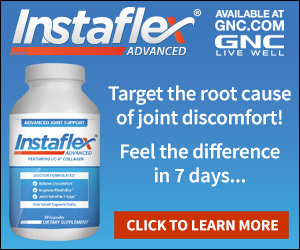 I don't know about the practices of Instaflex, but the ingredients for joint relief of Hyaluronic Acid, turmeric, and boswellia serrata, in combination with Glucosamine have really, really helped me. They are available in the Fast-Acting form of Trigosamine, another product available in drug stores. Be sure to get the orange and green label with all the right ingredients. Before using this I was hobbling around with sore feet, knees, back, neck and pain in hands and elbows after driving long distances. Was going to give up gardening, stairs and shrink my life. Now I do everything I once did and feel like my same old self. This combination really works. Give it enough time. Review #233033 is a subjective opinion of User233033. I always read the reviews to see whether the company is a scam or not, sounds just like focus factor. They just keep billing you even if you call them. I won't be ordering from this company. I;m not sure why all you people would buy this ingredient online, when in fact GNC has the product in their store, if there is no GNC near you check your other Vitamin stores, no NEED TO G0 ONLINE only to be ripped off and then complain about it. I live in Canada, we have many GNC's here, I will not purchase this ONLINE.